The Pour Moi Hot Spots Tie Side Bottom is understated and pretty. 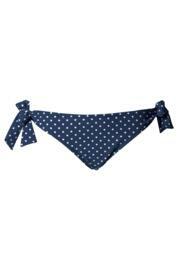 Featuring a spot print with matching tie sides. Not so keen on the side ties. Just reviewed this item, diff size. Bought two diff sizes, one too big and one too small unfortunately! 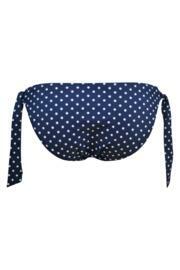 Would point out all the bikini bottoms this year are too low rise and don’t feel comfortable. I feel they are falling down even when tied tightly and don’t really cover your bottom properly. These ties are too thick, they also hang down too far when tied without a bow, or too short and stick out to the side when in a bow! Shame as quality, colour and feel are lovely. Did not suit me, even though it was lovely and returned for a different style which was lovely. Love this bikini. Bottoms are quite small though. Suggest going up a size to normal underwear size. GOOD FIT. GOOD DESIGN.WELL PLEASED.